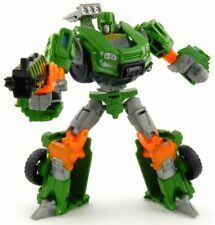 This would be a great addition to you ever growing TF collection you got! Hello Everyone! Includes box and instructions. See pics for most accurate depiction of condition. See pics for most accurate depiction of condition. It is in used condition with wear and tear. See pictures for condition. Waspinator has gun but no missiles. Dinobot is missing half of tail weapon. Rhinox is complete. Has no accessories. Missing Gorilla Face. During the original Japanese Beast Wars story this character was a powerfull bad guy. This toy is unopened and in good condition. Deluxe Beast Changers : Savage Beast To Noble Wolf. Optimus is missing his swords. One launcher is a little weaker then the other. It is in used condition with wear and tear. See pictures for condition. Plus, the bubble has started to yellow. Up for auction Transformers Universe 2x figure lot including the following Autobots: Skydive- and Snarl both new unopened in good condition. Combo shipping available with discounts on multiple auction wins within the US. I got a gorilla head for him. Displayed only in a smoke-free home. Feel free to ask any questions! I’m not aware of any issues - he has simply stood on my shelf since purchase and assembly. Condition : New, MOC (mint on card). Tigatron nice condition. Missing underbelly gun. Made by Hasbro in 2000, this toy is unopened and in good condition. Not complete. Paint / Decals / Scuffs / Rust / Dust etc. : SEE PHOTOS . Maximal Military Strategist Prowl. Both are new and sealed in box. It is in great condition. The joints and paint are solid. Missing his mace weapon. Only used for display from an adult collector. Its tail arm is a bit loose. Card and Instructions are included.